Really quick and easy - very refreshing, ideal starter for a light summer lunch with friends. Will definitely make again! Made as part of a BBQ without the salsa. Excellent! My least favorite recipe from this book so far. Just ok, nothing special. Maybe because I grilled them instead of baking in the oven? Best shrimp dish in a long time! Love the feta and shrimp combination combined with ginger and Aleppo pepper. Truly delicious. Simple, yet delicious. The combination with the sumac and pistachio dukkah and the tahini sauce elevates this dish to a dinner party crowd pleaser. Once you get past...the imprecision of the recipe prose, there are some truly innovative, progressive, and - yes - fairly swift riffs on classic Middle Eastern flavor combinations. 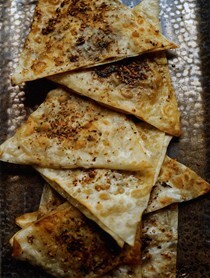 Orient Express is for busy cooks who want a touch of the light, beautiful cuisine of the eastern Mediterranean. 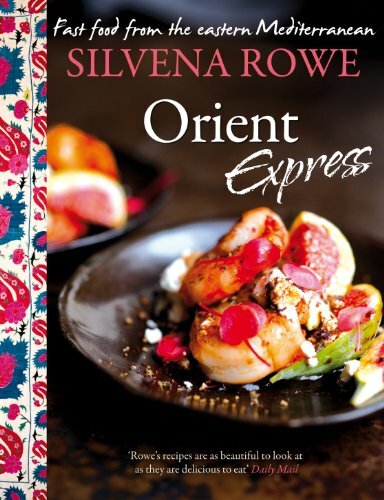 Following her acclaimed Purple Citrus and Sweet Perfume, Silvena Rowe turns her focus to the delicious small dishes that you would find in the bustling street markets of Damascus or Istanbul - koftes, falafels and pilafs - as well as delicious puddings such as vanilla baklava, and chocolate and pistachio mousse. In this treasure trove of a book she presents 100 light, enticing new recipes, perfectly balanced for mezze-style summer meals. This is a cuisine both for celebrating and sharing: Ottoman-inspired food, based around stunning combinations of sweet and sour - honey and cinnamon, saffron and sumac -and given a brilliant modern twist by one of the most exciting chefs working in Britain today. Silvena Rowe has an encyclopaedic knowledge of the foods and culinary traditions of the eastern Mediterranean. Her cooking is light and the presentation of her dishes is elegant and sophisticated, while the flavours are powerful and the textures balanced. Her enthusiasm for the food of her heritage is evident on every page.